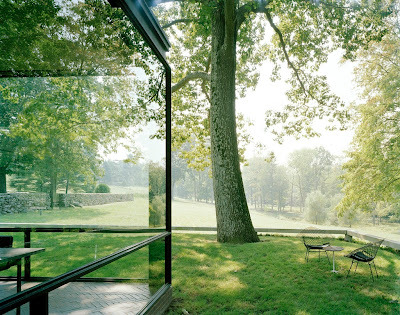 I think the first time I saw Philip Johnson's Glass House, it was in a photo projected against an enormous wall in a darkened art history classroom. Of course I was struck by the main pavilion's restrained lines and complete connection to the surrounding landscape -- the contrast of rigid man-made lines with naturally curving tree branches. Oh, and that sea of green grass and leaves (Connecticut countryside) visible through the glass walls. But last year, when I read Rosamond Bernier's account of her mid-1970s wedding to art critic John Russell, organized and hosted by Johnson at The Glass House, the place came to life for me. She wrote that her bridesmaid, Leonard Bernstein's daughter, carried wildflowers; maybe they came from the adjacent woods? New signs of life -- freshly cut flowers -- now greet visitors to the National Trust Historic Site, as part of a program to bring flowers back inside. 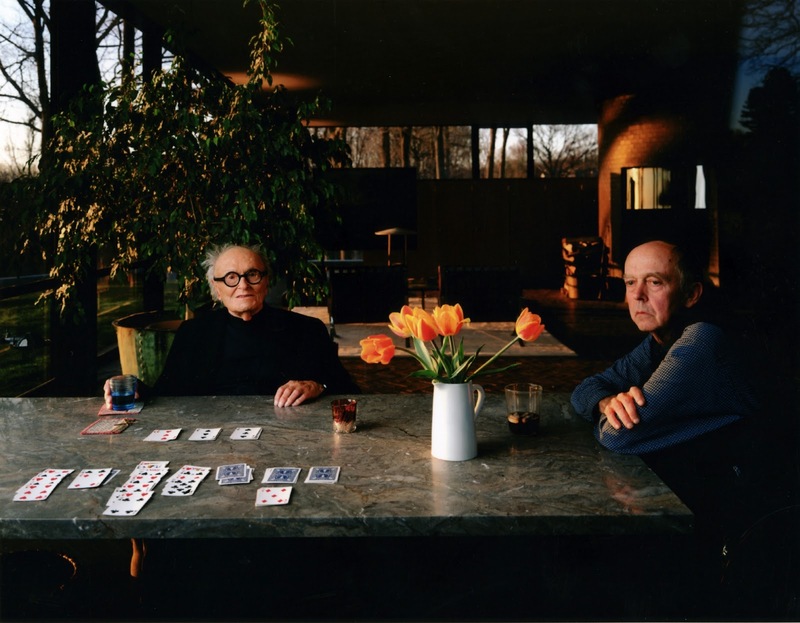 [Philip Johnson and David Whitney with fresh flowers at The Glass House, 2003. 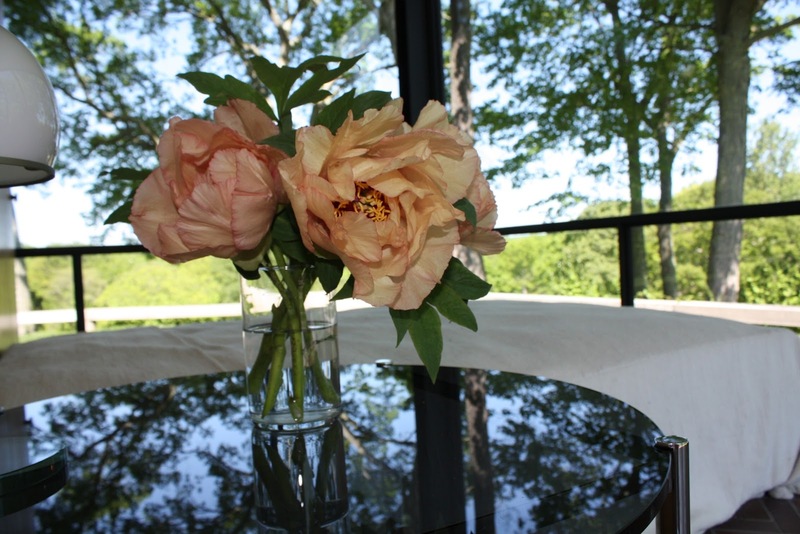 Although architect Johnson's longtime partner, David Whitney, was an enthusiastic gardner known for introducing to the 49 acres succulent and peony gardens, flowers have not appeared inside Glass House since both men died in 2005. Using primarily flowers grown on site, and referencing archive photos, designer Dana Worlock creates seasonal arrangements on view through November 2012. To learn about visiting this fall, click here. New works by Frank Stella will be included in a Glass House exhibition opening September 22. 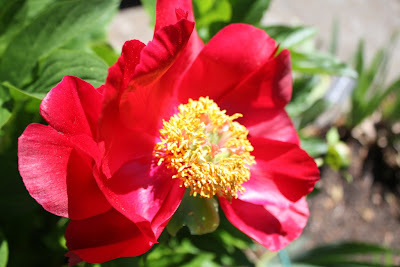 This post was updated with additional images 8.28.12. LOVE bringing in some fresh flowers to the interior to bring it to life -so often done in European house museums and oh so rarely here in the USA where they are kept very tight, life-less and 'museum-like'. I hope other house museums take note! Stefan -- me too! Hope you can visit and give us one of your signature tours.